Mollie Tucker's Field is a Caravan & Motorhome Club CL of ¾ of an acre and is open from March to the end of October. Hook-ups and water taps available on each pitch. The grass is mown regulary and dogs are welcome with well behaved owners! The site is within easy walking distance of the Village Green, The Pigs Nose Inn, Piglets Cafe and the Shop. Sorry, Caravan & Motorhome Club members only on this site. Find us on the Caravan and Motorhome Club website. View of Mollie Tucker's Field. Camping is available in July and August in 'Stephen's Field' and 'Little Hollaway'. The sites have toilets (bring your own toilet roll!) and wash hand basins and a drinking water tap. There are no showers on site but are available in the Pigs Nose Pub during lunch time and evenings (current price Adult £2, Children £1). 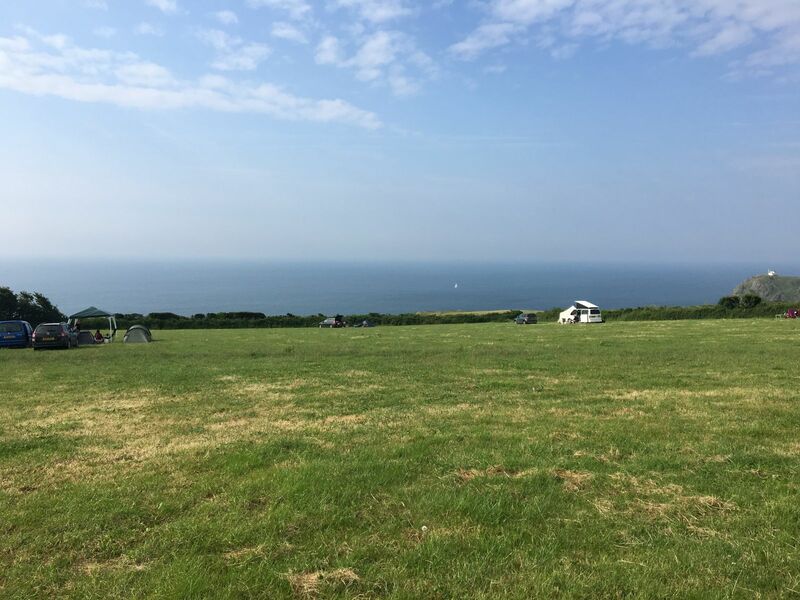 Both fields have panoramic views of the sea, Prawle Point and Start Point. Stephen's Field is close to the Village Green where you will find the Pigs Nose Inn, Piglet Stores and Cafe. Little Hollaway is closer to Prawle Point and the coastal footpath and is ideal for families. Well behaved dogs are welcomed but must be tethered when on site. You can just pitch up and the owner will call around in the morning. Please do not hesitate to telephone for further information. Visit us on Facebook - East Prawle Camping and Farm Holidays.